The All New Flexible Solar Panels are high RV grade monocrystalline cells designed to conform to any surface. They can be easily mounted with adhesive material or screw in through grommets. These panels are able to curve up to 30 degrees. The solar panel surface is walkable, being merely 1/8" thick. These panels use the compatible MC4 connector cables. It is a marine grade material. They're 82% lighter than other solar modules. These units produce more power per square foot than any flexible panel on the market. A lamination coats the entire module, making it easy to contour and flex against certain materials and surfaces. This eliminates any need for custom mounts. 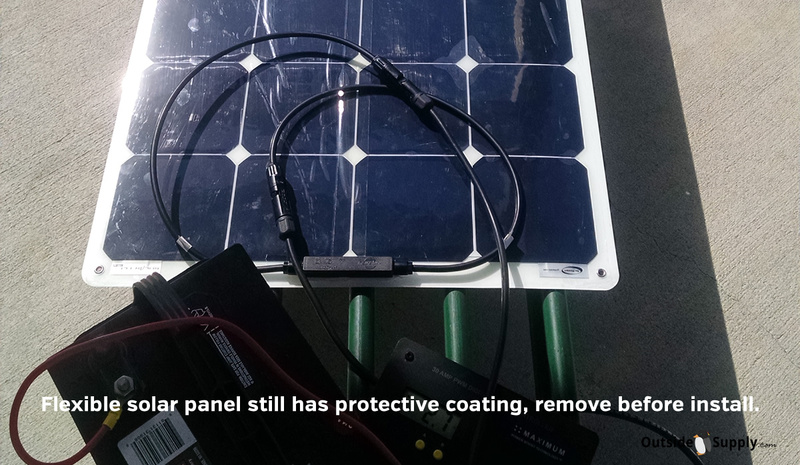 You can also sew the panel into canvas to make it the most versatile solar module on the market. These units are virtually unbreakable, making them aerodynamic and ideal for RVs, Boats and Trucks. Currently, we have 100 Watt and 30 Watt Flexible Solar Panel Options. These units give the sense of freedom for many people with Teardrop Trailers and Curved Body Campers. These can easily affixed on the side or back of a curved body for quick travel down the highway. We offer Charge Controllers for these options that protect the batteries and regulate voltage. We offer 7 to 30 Amp Charge Controller options depending on how much solar you’d like to add. You can operate laptops, printers, lights, TVs and more with these units when paired with an inverter. 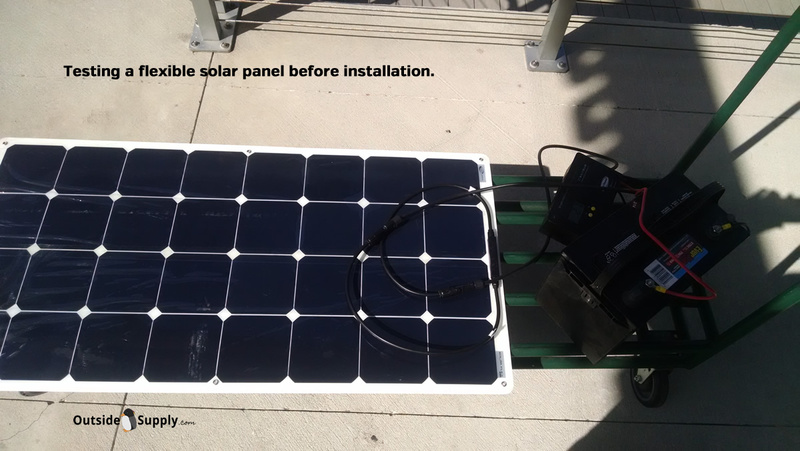 Your 12 Volt system should have a great backup power source like a Flexible Solar Panel. Keep your batteries topped off easily and often. A lot of people stow their boat and need a power source to keep the batteries topped off. These flexible panels are great for that option. They’re so lightweight they won’t weigh down any material, even canvas. Aluminum grommets make it easy to install these panels. They come with a built in junction box that’s only .6” thick on the back of the panel. The cables are 6’ long and offer male and female quick connect MC4 connectors. The strength of these units has been checked with walkable tests and flex options done. You won’t have to worry that these units are ready for the challenge.